Piazza Cesare Beccaria is a square located at the intersection of the Giovine Italia and Amendola boulevards. 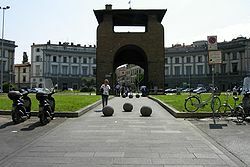 It was realized by the architect Giuseppe Poggi when Florence was the capital of Italy and was dedicated to Cesare Bonesana Marchese di Beccaria in 1876. This square is surrounded by several concave neoclassical palaces and overlooked by the State Archives building.